We Filipinos are known to be an ingenious bunch. We transformed former World War II US jeeps into the jeepneys that we use today. We welded a bunch of metal bars and sheets together to form the car of the tricycle. And who could forget our habal-habal/Skylab with its T-shaped crossbeam seat to accommodate 10 or more passengers. Maybe it’s because resources are scarce and that we’re just taking the thrifty route. Maybe it’s because of the "pwede na yan" thinking, or maybe because we’re just too darn smart. Unfortunately, that last one seemed pretty difficult to agree with after watching this. Confused of what just happened? According to the video’s description, the poster of the video had a nail stuck into his van’s front right tire. He then arrived at the nearest talyer to get it removed. 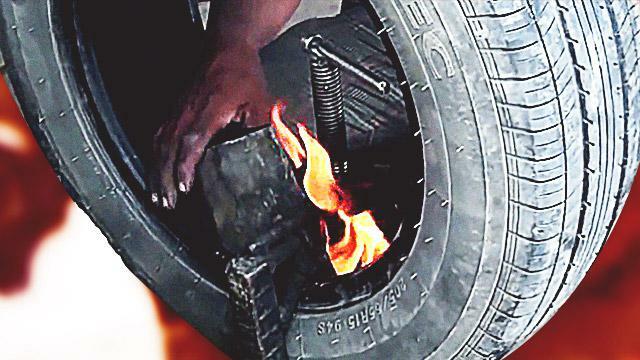 And the mechanic removed it all right, by using crude tools, his own weight, and lighting a fire dangerously close to the tire while melting a piece of rubber into the hole. He almost scratched the rims too when he was bolting the wheel back and he didn’t even mind checking its balance. The cringe-worthy video was uploaded October of last year. It got international attention recently as it was featured on Jalopnik, one of the world’s most-visited blogs dedicated to cars. They broke down the whole ordeal, and ended by not recommending this method to anyone. Also, there were some who agreed to what manong did. "I suppose you’re freaking out because you saw a naked flame being used to vulcanize the tire patch," said one commenter. "Well you may be surprised to know that you used to be able to get 'hot patch' tire repair kits that had inflammable chemicals that you’d ignite and clamp in a similar fashion to what you see here." So it seems this Pinoy method isn't uncommon after all. What do you think about the mechanic’s work? Was he too darn smart? Or was he just lucky that he didn’t damage the wheel finish or any other part of the car? And just like the poster of video, are you willing to let flames that close to your tires? Putting aside all those questions, what is clear though is that we Filipinos are truly an ingenious bunch who gets the job done either way.